Whether you are looking for the perfect Easter table arrangement or want to send the warmest of Easter wishes, our Happy Easter bouquet will do just that. 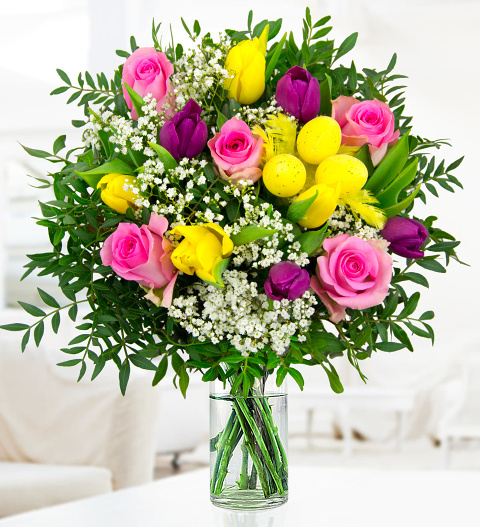 A traditional and exciting arrangement with Spring tulips, pink roses and gypsophilia. The theme is completed with the nestling of some Easter eggs and spring feathers. The bouquet wouldn't be complete without a box of chocolates and guess what; we have added a free box with every order! Chocolates may contain nuts.